Aggressive look. Powerful performance. 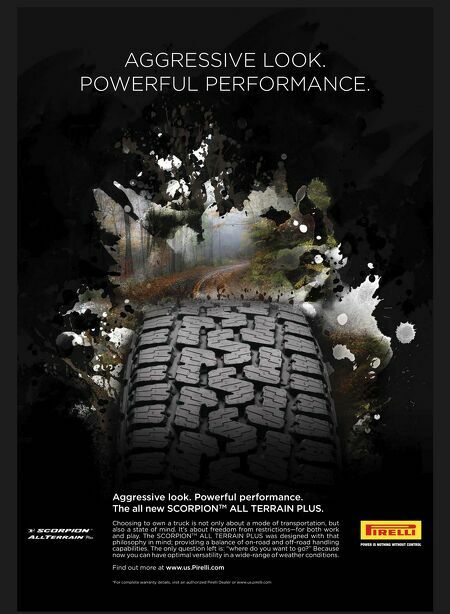 The all new SCORPION TM ALL TERRAIN PLUS. Choosing to own a truck is not only about a mode of transportation, but also a state of mind. It's about freedom from restrictions—for both work and play. The SCORPION TM ALL TERRAIN PLUS was designed with that philosophy in mind; providing a balance of on-road and off-road handling capabilities. The only question left is: "where do you want to go?" Because now you can have optimal versatility in a wide-range of weather conditions. Find out more at www.us.Pirelli.com *For complete warranty details, visit an authorized Pirelli Dealer or www.us.pirelli.com AGGRESSIVE LOOK. POWERFUL PERFORMANCE.